"Unfold your heart. Sharpen your ears. And never say no to the world when it asks you to dance." First of all, if any book could be purchased for cover art adoration alone, it would be this one. Just look at the colors and intricate illustrations! 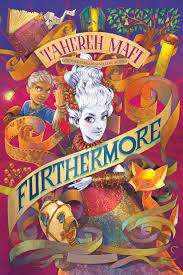 This book is Alice and Wonderland meets Willy Wonka meets Stardust meets The Hitchhiker's Guide to the Galaxy. I felt similar vibes of all of those books in this one because of the whimsical and preposterous situations and encounters. Are flowers a tasty snack? Is color a form of currency? Does the sun rain? Of course, to all of those, if you live in Alice's hometown of Ferenwood. "The morning arrives the way Alice imagined a whisper would: in tendrils of gray and threads of gold, quietly, quietly. The sky was illuminated with great care and deliberation, and she leaned back to watch it bloom." Simply magical! But the magical doesn't come just from the descriptions, but also from the dialogue. Mafi's character dialogue is quick and witty, and seems very British. As I read the character's conversations, I gave them British accents in my head. It only seemed proper, and it made it all the more adorable. -The narrator consistently addresses the reader and has cute little side comments throughout the story. -The chapter dividers have fun illustrations and words, such as "I haven't any idea how many chapters are in this book." -The play on words the author enjoys is amusing: "His [prison] sentence was very long...it was made of many words." "The simple truth was that Alice would always be different—but to be different was to be extraordinary, and to be extraordinary was an adventure." "Love, it turned out, could both hurt and heal." I recommend this book if you want to take a fantastical, imaginative journey and smile along the way.